National Rf, Inc., a San Diego based radio frequency devices company, is pleased to announce the development of an ultr-low frequency atmospheric, seismic, and geophysics research receiver. Called the RAS-1, the receiver is designed for ultra low and very low frequency scientific research work, including the exploration of low frequency emissions due to seismic and earth-quake activity, study of atmospheric phenomenon such as "whistlers", and low frequency Sudden Ionospheric Disturbance (SID) and electromagnetics phenomenon. The RAS-1 will receive signals from under 200 Hz. To over 250 KHz in both narrow bandwidth modes as well as broad badnwidth reception. Designed for field research use, the unit features several output modes. First, a 1 milliamp detected output drive is provided for standard strip-chart recorder interface. In addition, a front panel meter provides a real time display of frequency under observation. Second, an audio output, with an internal speaker, allows the user to monitor the demodulated signal going to the data recorder. Finally, a signal frequency output is provided so that the unit may be used in front of a spectrum analyzer or external low frequency receiver. As much as 40 dB of gain is provided on this output, controlled by a front panel adjustment. Overall the RAS-1 provides over 90 dB of gain to the recorder and audio outputs. Several different sensor units are utilized to detect the low frequency signals. A broadband sensor provides reception of the ultra-low frequencies between 200 Hertz and 30 Kilohertz. Several low pass and high pass filters are incorporated in this sensor to reject 60 Hertz power noise and to limit the upper end bandpass frequencies to 20 Khz and 10 Khz. This sensor incorporates a 6 foot telescoping whip antenna as the electromagnetic sensing element. Three other tuned sensors, incorporating ferrite sensing elements, in conjunction with the front panel tuning control, allow reception of 15- 50 KHz range, 30 –150 KHz range, and 100 - 250 Khz range. Bandwidth is controllable from a front panel switch with allows sharp, medium, and broad receive bandwidths. All sensors plug into the top of the RAS-1 chasis, and allow for 180-degree mechanical rotation for 60 Hz noise rejection. The equipment provides an internal battery supply or may be powered from an external 12 Volt battery. 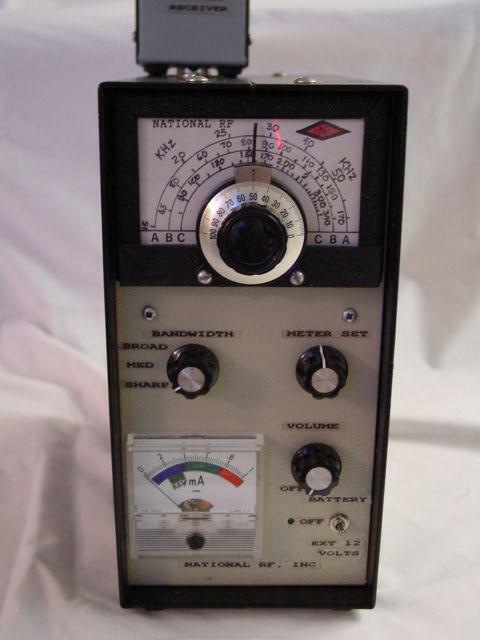 For Pricing and Availability of the RAS-1 research receiver, contact National RF, Inc., 7969 Engineer RD., Suite 102. San Diego, CA 92111. The company phone numbers are 858-565-1319, or FAX 858-571-5909.